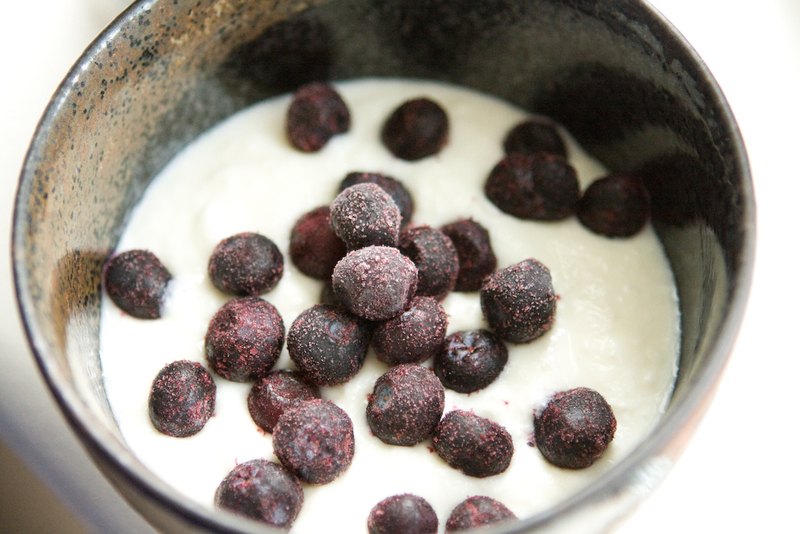 An exciting recipe find: homemade yoghurt! I spent the weekend doing nothing much other than trying to recover from this damn cold. So rather than writing an entire post to complain about this cold, I will share with you my most exciting news from this weekend. I found this recipe on how to make homemade yoghurt. And the best part is, it’s super easy, and very economical. And honestly, I actually prefer the taste of it over a lot of store bought yoghurt. I stumbled upon the recipe while searching under “breakfast” and “low carb” categories of a recipe database. Prior to this, I’ve only heard of homemade yoghurt from a friend who had a lot of time on her hands. She made it sound like such a complicated endeavour that I was turned off before I even thought of trying it. Heat up 4 cups of milk in a heavy saucepan to 180C. Stir the milk so it heats evenly without burning or scalding. Let the milk cool to 110C. You can put the saucepan in an ice bath to speed up the process, or just let it sit until it cools enough. Stir 3 tablespoons of your favorite store bought plain yoghurt (one with active culture) into 1 cup of the warm milk. I used an unsweetened Greek yoghurt. Then combine with the remaining 3 cups of warm milk. Place everything in a clean plastic container. Loosely cover the container, and place the container in your oven with the oven light on. Leave it for 8-12 hours (I did 12 hours). Don’t disturb the yoghurt while the culture is at work. Viola! 12 hours later, you’ve got a whole container of yoghurt! You can drain it over some cheesecloth to get a thicker yoghurt, or just eat it as is. Chill in the fridge. Sweeten with honey as needed. I put some frozen blueberries on the yoghurt, and drizzled a little bit of honey. I must say it was better than I expected. It was so creamy, and not a hint of tartness. The entire process took maybe 10 minutes. I used whole milk for this first batch. I’m currently making a second batch with 1% milk. I would think the 1% milk will make a less-creamy yoghurt. I’ll report back after tasting it tomorrow. **Update: Ok, so the product made with 1% milk is less creamy than one made with whole milk. It’s not watery, but just tastes…lower fat. I do still like it. I think I’ll try 2% next time and that’s likely a good compromise. This entry was posted in Cooking and tagged recipe, yoghurt, yogurt by angelasaito. Bookmark the permalink. Angela – thanks for sharing. I used to make homemade yogurt with my grandma and agree the taste is waaaay better than store bought. 1% will be less creamy. We found 2% milk to provide pretty good balance. Enjoy! Cool! Thanks for the tip on the %! I ate the last batch in a day. The 1% batch may not last long. I will try the 2% next!